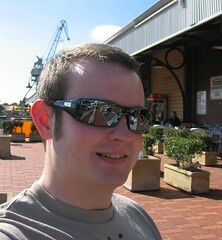 That’s me sat in the sunshine on Fremantle Harbour, waiting for my waffles to be delivered. Mmmm… waffles. See more photos taken on 17th May 2006, or all of my photos from Australia and Brunei. This entry was posted on Wednesday, May 17th, 2006 at 11:13 pm and is filed under Holiday, Photo.